When we touched down in the UK we were in Europe. When we left a few days later it felt like we were fleeing ‘Brexit’ rubble—a deeply polarised nation. Meanwhile as the mass media obsessed over regional percentages of ‘stay’ or ‘leave’ votes London’s underground transport system was in chaos due to mass flooding. Again. Nobody we spoke with denied that human induced climate change was largely responsible for the ongoing—at times tropical-style—torrential rain. There’s no question that the ‘Brexit’ narrative was nasty and base in frightening ways. Given the artful methods in which UK’s ruling elite has been further amassing obscene wealth via EU land subsidies while imposing harsh austerity measures on the most vulnerable local workers its no wonder that so many disenfranchised people employed what little power they do have to vote for change. Uncertain as it may be. In such situations we think it best to unpack what independent information is available for public scrutiny with a pragmatic approach. Which country appears married to gas fracking as the highly destructive, hence controversial extraction technology is being banned in successive European Union countries? Which country stands to lose the most from a Financial Transaction Tax (aka Robin-hood or Tobin Tax) of circa .01%-0.1% of the value of institutional share market trading? In which country does the Murdoch media empire—a key mouthpiece for environmentally destructive industries—control the so-called ‘news’ of the day? 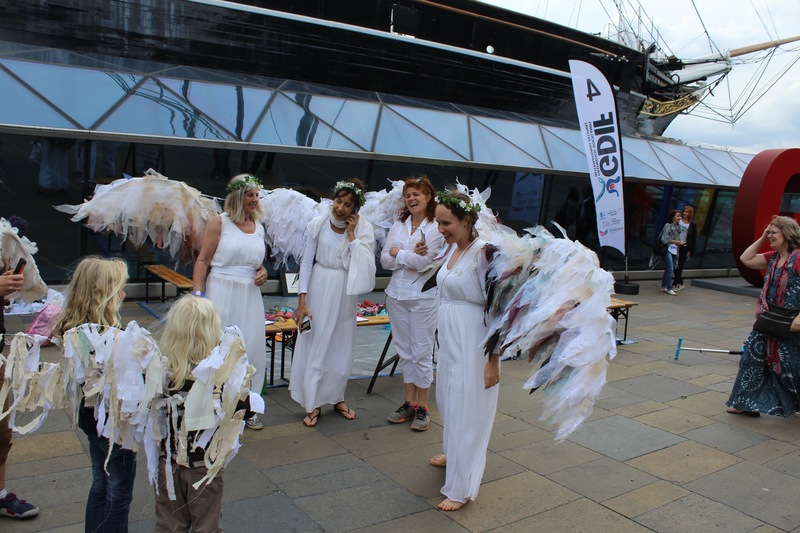 Arranged by the awesome Pippa Bailey from Performing Lines, the Climate Guardians performances at Greenwich+Docklands International Festival (GDIF) reached several thousand people between the 24th and 27th June 2016. 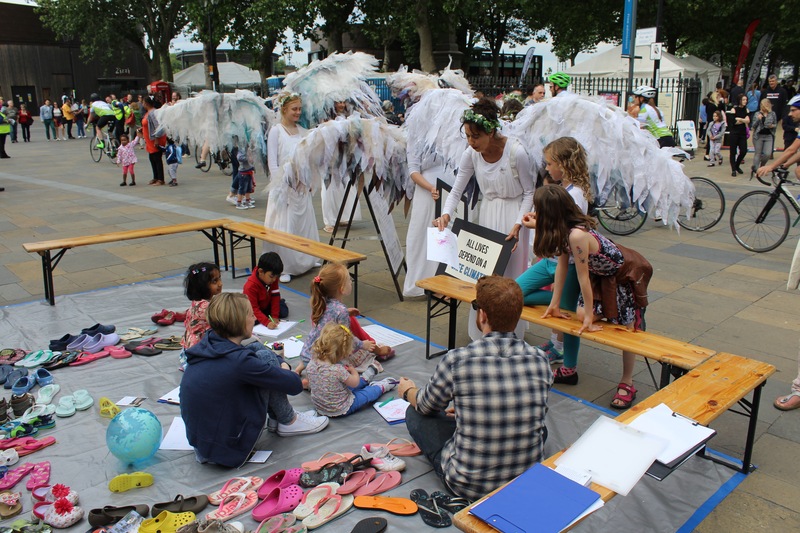 With children, parents and carers we conducted ‘Climate Guardian’ wing-making workshops while discussing the necessary steps leaders must take to preserve nature and safeguard humanity. At the Festival we met people from all around the world and found that most were already aware and deeply concerned that the Great Barrier Reef is dying and feel strongly that the Australian government is failing to protect this precious world heritage listed environment asset. It goes without saying that people were entirely shocked to learn that within days of committing to the Paris Climate Agreement the Turnbull Government had approved the world’s largest coal extraction project adjacent to the Reef’s Marine Park. We assured them that a growing number of Australians are now pressuring decision makers at all levels to consider both our precious Reef and the global climate re all decision making. 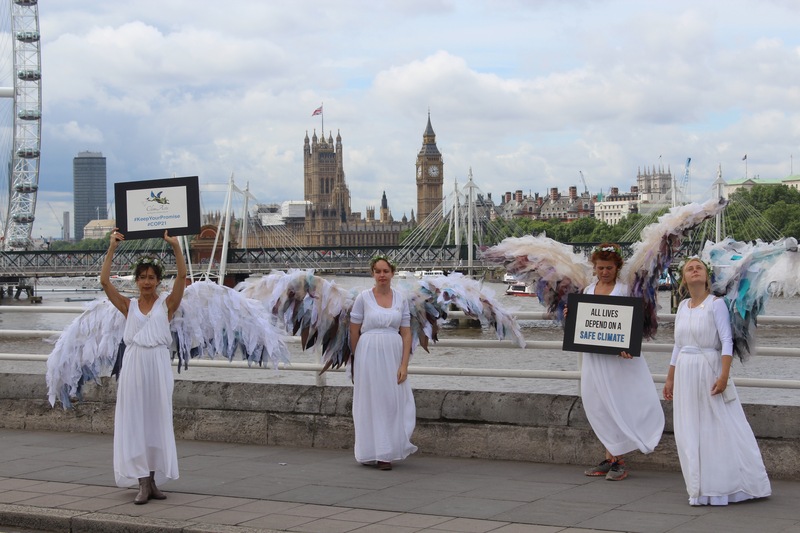 Of course with more voices calling for climate and environment security the louder we’ll be heard. In addition to wing making workshops we hosted a ‘Shoes for Hope’ installation reminiscent of the community display of shoes in La Republique on the eve of COP21 in Paris. On that occasion the shoes represented people who would have been in the Climate People’s March had Paris not been thrown into a state of emergency—including an all out ban on public protesting—following the brutal terrorist attacks unleashed a couple of weeks earlier. 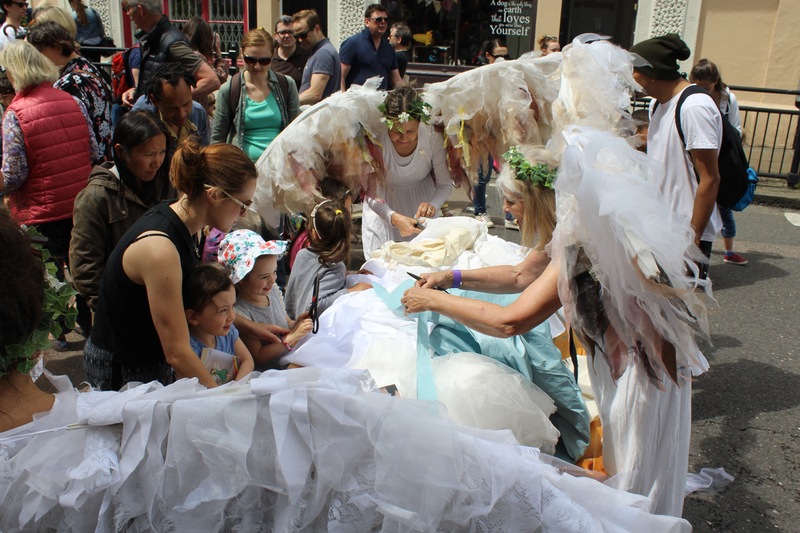 At GDIF 2016 our installation served as both a tribute to those whose lives were shattered in Paris in November 2015 and a warning that if drastic measures aren’t urgently taken by leaders everywhere we will witness uncontrollable mass migrations of people as climate change destroys local environments. 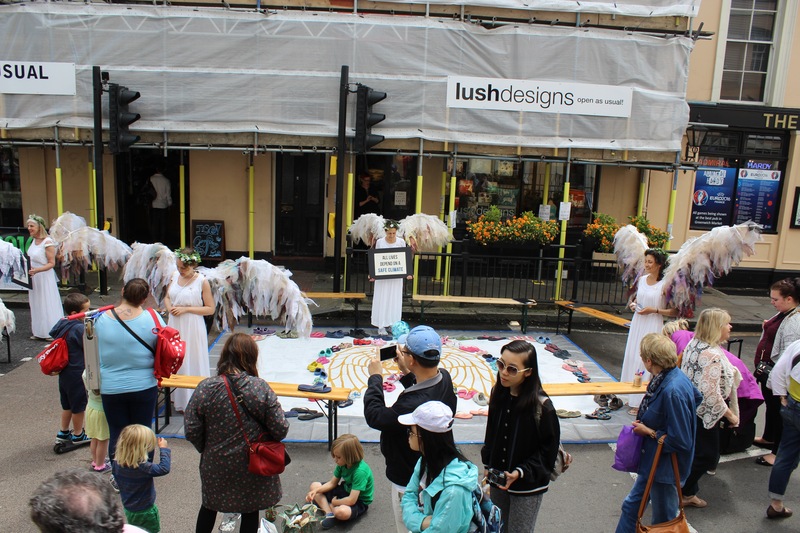 People were invited to place their own shoes within our installation and to consider what impacts a changing climate would have on people and nature around the world. 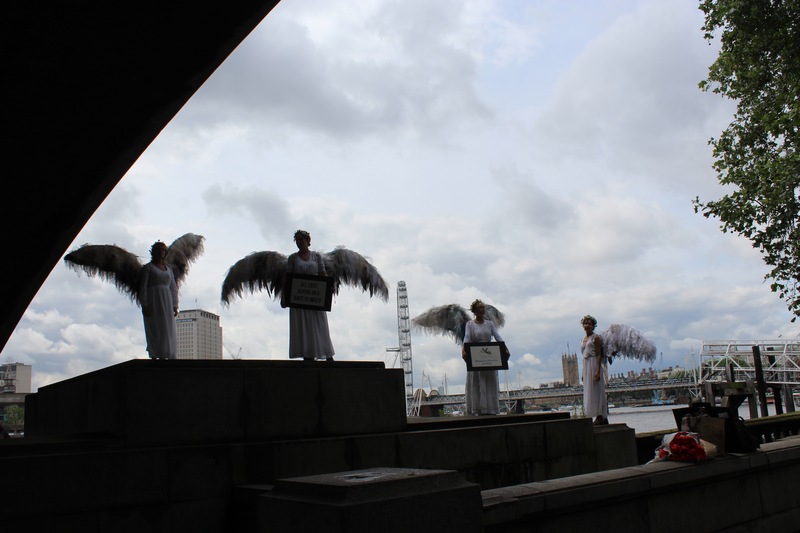 They were also encouraged to write or draw messages to world leaders about what steps must be urgently taken now to avoid the most devastating impacts of climate change. Over the weekend spates of unseasonal torrential rain served to reinforce our climate messaging. An irony not lost on festival goers. 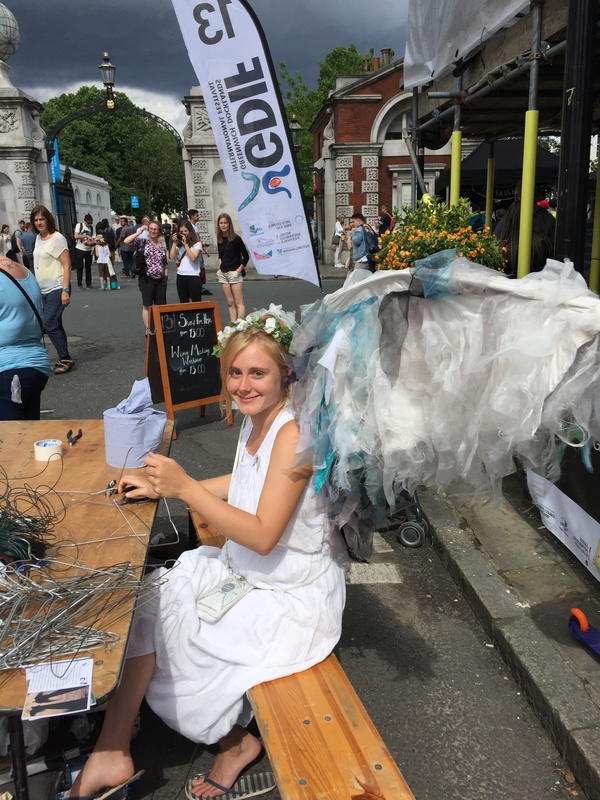 Despite the crazy weather, GDIF 2016 was a truly heart-warming experience. 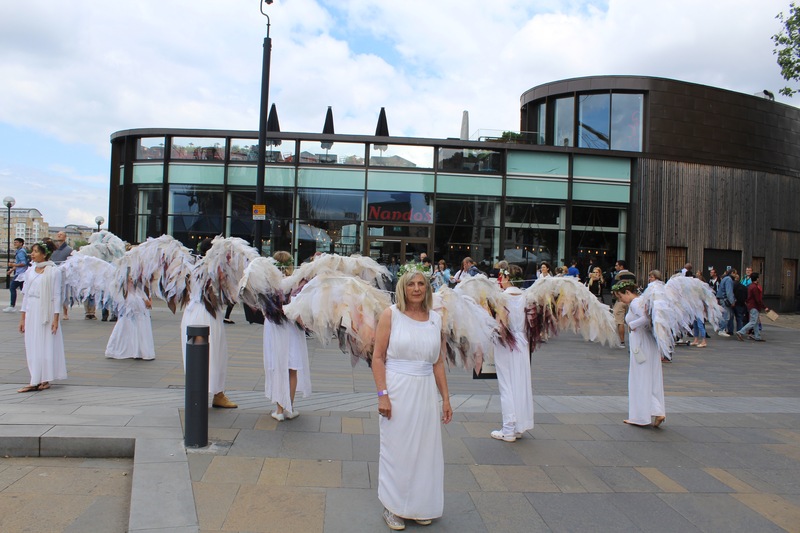 We connected with the most divine local Angels and could not have been more pleased with peoples’ responses to our ‘visitation’. It’s been an absolute privilege to have seeded many new ‘Climate Guardians’ in the UK – at a time when they’re needed most.